A floating production, storage and offloading (FPSO) unit is a floating vessel used by the offshore industry for the processing of hydrocarbons and for storage of oil. A FPSO vessel is designed to receive hydrocarbons produced from nearby platforms or subsea template, process them, and store oil until it can be offloaded onto a tanker or transported through a pipeline. FPSOs are preferred in frontier offshore regions as they are easy to install, and do not require a local pipeline infrastructure to export oil. FPSOs can be a conversion of an oil tanker or can be a vessel built specially for the application. A vessel used only to store oil (without processing it) is referred to as a floating storage and offloading vessel (FSO). Oil has been produced from offshore locations since the late 1940s. Originally, all oil platforms sat on the seabed, but as exploration moved to deeper waters and more distant locations in the 1970s, floating production systems came to be used. The first oil FPSO was the Shell Castellon, built in Spain in 1977. The Sanha LPG FPSO operates offshore Angola, and is the first such vessel with complete onboard liquefied petroleum gas processing and export facilities. It can store up to 135,000 cubic meters of LPG while awaiting export tankers for offloading. There are so far no LNG FPSOs. In the opposite (discharge and regasification) end of the LNG chain, the first ever conversion of a LNG carrier (Golar LNG owned Moss type LNG carrier) into an LNG floating storage and regasification unit was carried out in 2007 by Keppel shipyard in Singapore. An LNG FPSO works under the same principles an oil FPSO works under, taking the well stream and separating out the natural gas (primarily methane and ethane) and producing LNG, which is stored and offloaded. On July 29, 2009, Shell and Samsung announced an agreement to build up to 10 LNG FPSOs:  Likely size and capacity: 456 meters in length and 74 meters in width, with a capacity of 450,000 cubic meters Estimated cost $5b. Already Flex LNG has four contracts for smaller units at the same yard. Oil produced from offshore production platforms can be transported to the mainland either by pipeline or by tanker. When a tanker is chosen to transport the oil, it is necessary to accumulate oil in some form of storage tank such that the oil tanker is not continuously occupied during oil production, and is only needed once sufficient oil has been produced to fill the tanker. At this point the transport tanker connects to the stern of the storage unit and offloads oil. In the early days, the storage units consisted of decommissioned oil tankers, which were stripped down and equipped with process/production facilities (becoming therefore FPSOs), and were connected to a permanent mooring point. Today, there are two main types of FPSOs, those built converting an existing oil tanker, and those that are purpose-built. The FPSO design will depend on the area of operation. In benign waters the FPSO may have a simple box shape or it may be a converted tanker. Generally (but not always) the production lines (risers) are connected to a major component of the vessel, called a Turret, which allows the vessel to rotate in order to head into the wind and reduce environmental forces on the moorings. In relatively calm waters, such as in West Africa, turrets can be located externally to the ship structure, hanging off the bow of the FPSO. For harsher environments like the North Sea, the turret is generally located internally. The turrets and the mooring systems can be designed to be disconnectable or to remain permanently moored. Most ship-shaped FPSOs in the North Sea are purpose-built and are permanently moored. While most FPSOs are ship-shaped, FPSOs may also be semi-submersible type platforms with storage or may have a cylindrical shape (see Sevan Marine). These are moored in fixed orientation. An FPSO has the capability to carry out some form of separation process. If the unit does not have such facilities, it is generally referred to as a Floating Storage and Offloading unit (see below), and would be operated in conjunction with a production platform. Floating production, storage and offloading vessels are particularly effective in remote or deepwater locations where seabed pipelines are not cost effective. FPSOs eliminate the need to lay expensive long-distance pipelines from the oil well to an onshore terminal. They can also be used economically in smaller oil fields which can be exhausted in a few years and do not justify the expense of installing a pipeline. Once the field is depleted, the FPSO can be moved to a new location. In areas of the world subject to cyclones (northwestern Australia) or icebergs (Canada), some FPSOs are able to release their mooring/riser turret and steam away to safety in an emergency. The turret sinks beneath the waves and can be reconnected later. 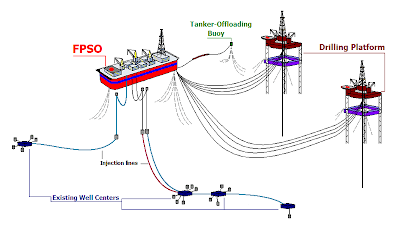 A floating storage and offloading unit (FSO) is a floating storage device, which is a simplified FPSO without the capability for oil or gas processing. Most FSOs are old single hull supertankers that have been converted. An example is Knock Nevis, ex Seawise Giant, the world's largest ship, which had been converted to an FSO to be used offshore Qatar. At the other end of the LNG logistics chain, where the natural gas is brought back to ambient temperature and pressure, ships may also be used as FSRUs. A LNG floating storage and regasification unit (FSRU) is a floating storage and regasification system, which receives liquefied natural gas (LNG) from offloading LNG carriers, and the onboard regasification system provides natural gas send-out through flexible risers and pipeline to shore. FPSO Firenze moored at Hellenic Shipyards, 2007The FPSO operating in the deepest water depth is the Espirito Santo FPSO from Shell America operated by Brazilian Deepwater Production Ltd (a joint venture between MISC Bhd and SBM Offshore). The FPSO is moored at a depth of 1,800 m in the Campos Basin, Brazil and is rated for 100,000 bpd. The EPCI contract was awarded in November 2006 and first oil was achieved in July 2009. The FPSO conversions and internal turret were done at Keppel Shipyard Tuas in Singapore and the topsides were fabricated in modules at Dynamac and BTE in Singapore. The world's largest FPSO is the Kizomba A, with a storage capacity of 2.2 million barrels (350,000 m3). Built at a cost of over US$800 million by Hyundai Heavy Industries in Ulsan, Korea, it is operated by Esso Exploration Angola (ExxonMobil). Located in 1200 meters (3,940 ft) of water at Deepwater block 200 statute miles (320 km) offshore in the Atlantic Ocean from Angola, Central Africa, it weighs 81,000 tonnes and is 285 meters long, 63 meters wide, and 32 meters high (935 ft by 207 ft (63 m) by 105 ft). The world's smallest FPSO is the Crystal Ocean, operating in 137 m of water in the Bass Strait between Australia and Tasmania on the Basker Manta Field. It is leased by Roc Oil (Sydney-based international petroleum exploration and production company) from Rubicon Offshore and is operated on their behalf by AGR Asia Pacific; it is currently producing 5,000 bpd. The FPSO in the shallowest water depth of just 13 m is the Armada Perkasa in the Okoro field in Nigeria, West Africa, for Afren Energy. This spread moored (fixed orientation) vessel uses 100 mm, 150 mm and 200 mm bore DeepFlex non-steel flexible risers in a double lazy wave formation (with weights and distributed buoyancy) to accommodate the large motion offsets in an environment of extreme waves and currents. The Skarv FPSO, developed and engineered by Aker Solutions for BP Norge, will be the most advanced and largest FPSO deployed in the Norwegian Sea, offshore Mid Norway. Skarv is a gas condensate and oil field development. The development will tie in five sub-sea templates, and the FPSO has capacity to include several smaller wells nearby in the future. The process plant on the vessel can handle about 19 MSm3/d (670 MScf/d) of gas and 13,500 Sm3/d of oil (85,000 bbl/d). An 80 km gas export pipe will tie in to Åsgard transport system. Aker Solutions (formerly Aker Kvaerner) developed the front-end design for the new floating production facility as well as the overall system design for the field and preparation for procurement and project management of the total field development. The hull is an Aker Solutions proprietary "Tentechtm975" design. BP also selected Aker Solutions to perform the detail engineering, procurement and construction management assistance (EPcma) for the Skarv field development. The EPcma contract covers detail engineering and procurement work for the FPSO topsides as well as construction management assistance to BP including hull and topside facilities. The production start for the field is scheduled for August 2011. BP awarded the contract for fabrication of the Skarv FPSO hull to Samsung Heavy Industries in South Korea and the Turret contract to SBM. The FPSO has a length of 292m, breadth of 50.6m and is 29m deep and accommodate 100 people in single cabins. The hull will be delivered in January 2010.